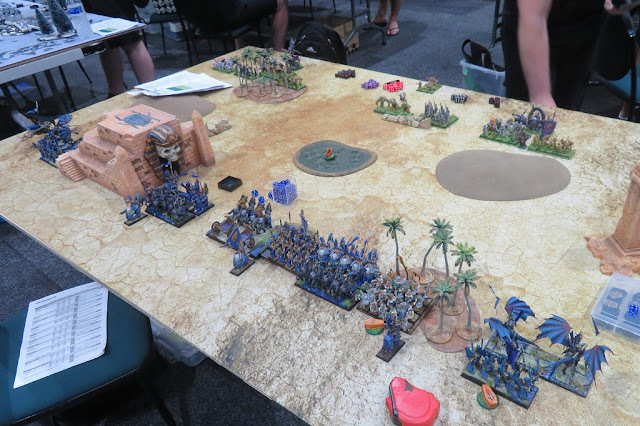 In the last game of the day I played against Chris and his old school Undead force. We have played against each other many times, both at the events and at local stores. It is always fun to play against him and always a big challenge as his Undead do not crumble easily. On many occasions I was actually soundly beaten so I hoped that this time I will come up with a good plan and would be able to win. Chris approach to the army composition seems to favor variety of units so the force he brought to the event was very varied and was comprised of many different units. It seems to be slower, with the exception of Werewolves and the King on the Wyrm but thanks to Surge it has a very different dynamics and can still catch the units that go too far unsupported. It has some good staying power thanks to Heal and good defense for some units. Because of that it can actually go into war of attrition versus my own army, which I would try to avoid. 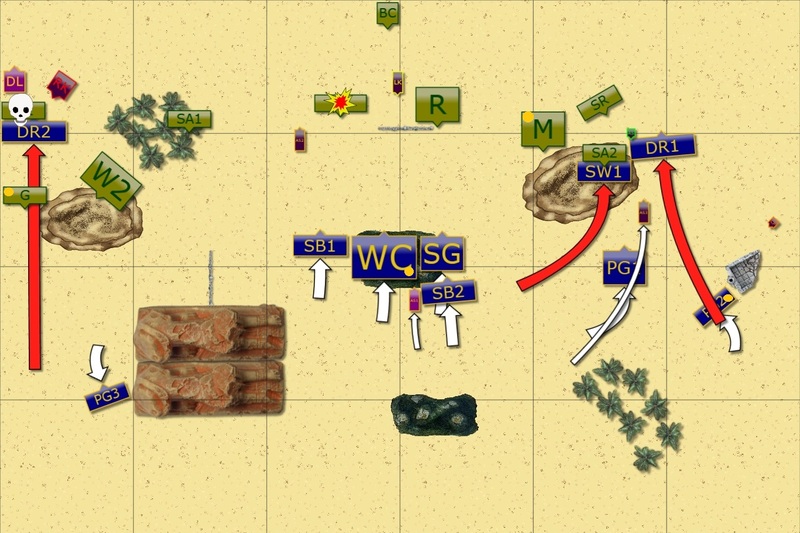 What I always find tricky is that I would like to use the speed and maneuverability to my advantage but somehow I am often denied good areas to move my units to and to be able to prepare these multiple charges I need in order to win against the tougher and more resilient formations. We played Push scenario and we got two tokens each for 5 tokens total. I like this scenario because it requires the ability to predict where the tokens would go for the opposing army, how to prevent them to get to my half while at the same time trying to predict if there is any safe path for my units to carry theirs to the enemy zone. I entertained the thought of placing both token on one of the Palace Guard troops the way I did before. That is why I placed both Drakon Rider regiments on each flank as well, to cover the advance of the Palace Guard troops behind them. 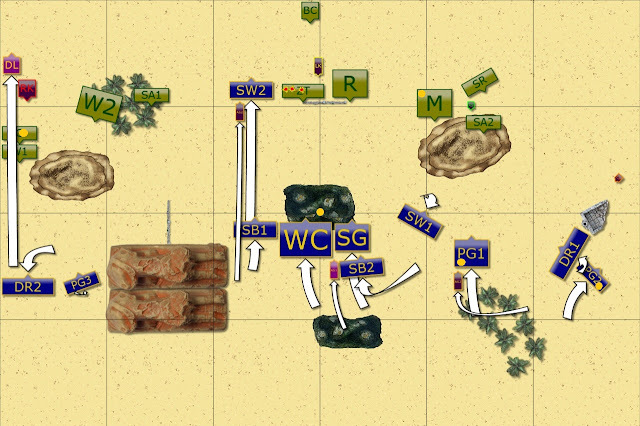 However, when we deployed it was clear I cannot simply pick one of the flanks. On my left Chris had a strong contingent with his own token. So that path was blocked and I had to focus on how to slow down the advance of the enemy units there. On my right the path seemed to be open but the presence of the Pharaoh meant I would risk too much if I placed both tokens on Palace Guard troop. 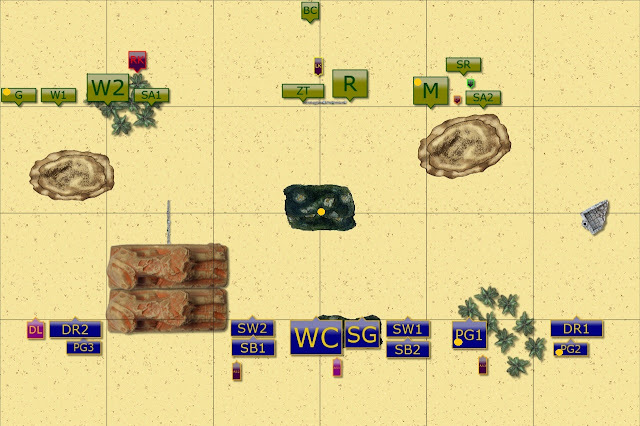 At the same time I had to deal with the Mummies so it further convinced me I need to disperse the tokens this time. I placed my shooters in the middle because I wanted them to be able to contest the center or even push for it if the circumstances are favorable. 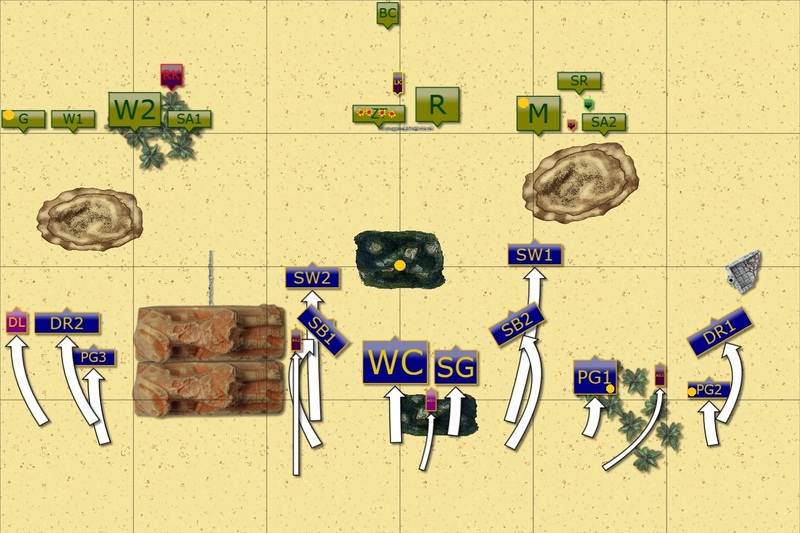 And reinforced this formation with heavy cavalry as I thought it would give me some flexibility in using them either in the center or moving them against the flanks. In general, my plan was to slow down the left, get the center and move on the right to get my units to the enemy half while keeping the foe there at the same time. The challenge was not to lose important units in the process and hold long enough to keep 3 tokens in my possession and in the enemy half if possible. I got the first turn this game. Elves moved forward, a bit cautious on the flanks in order to stay out of charge range of the enemy units. And to allow the units in the center to shoot at the Zombie trolls. The creatures sustained some damage but were otherwise not impressed at all. The fact they were brain dead could be a contributing factor too. Undead shamble forward a bit. Ever patient Undead moved forward too but at a slower pace. They had all the time in the world. The fliers on both flanks moved to position to potentially intercept any reckless Elven units. The catapult and the Archers aimed at viable targets and scored some hits too. Hot headed Knights move into a trap. 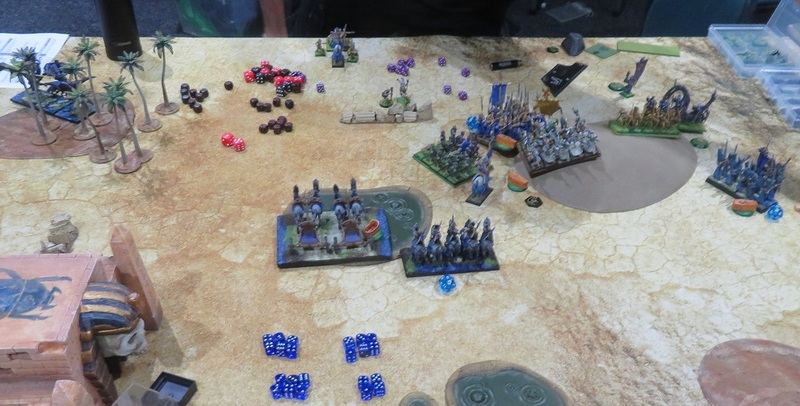 Some reckless Elven knights could not resist the temptation and stormed through what seemed to be like a perfect avenue towards the enemy catapult. If they succeeded they would not only destroy the war engine but threaten enemy rear too. Unfortunately, that was exactly what Undead wanted. 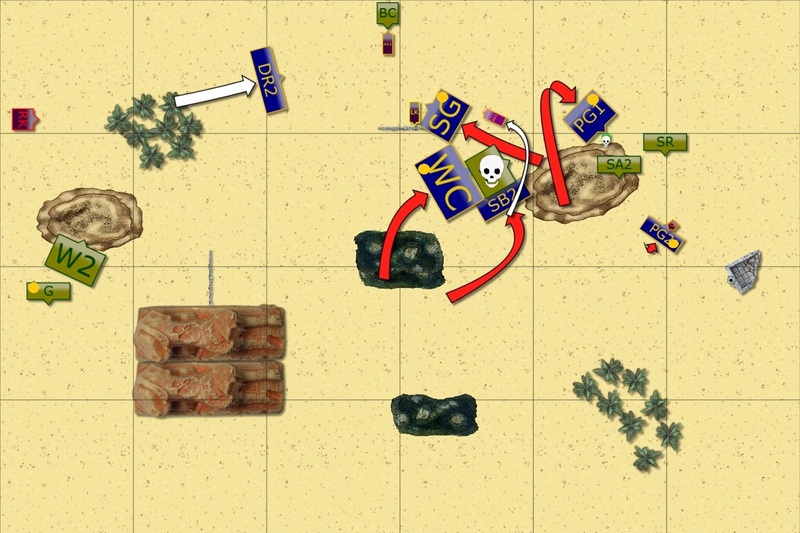 The shooters tried to help and destroy the nearby trolls but the arrows did not do enough damage to break the bond between the worlds of dead and living. 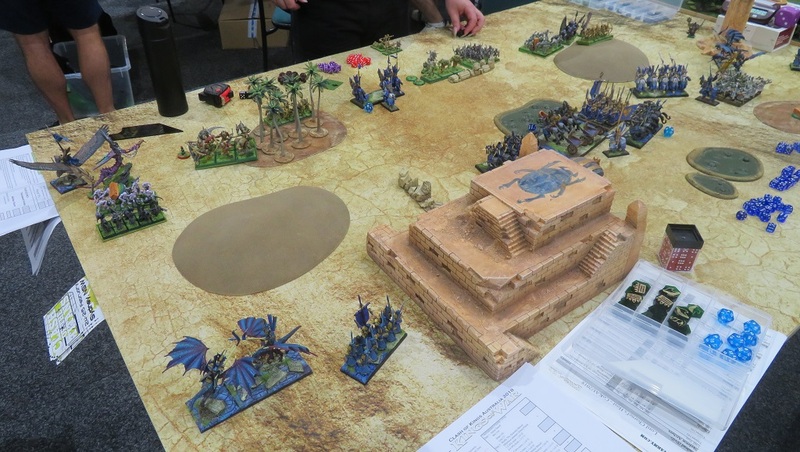 On the left flank the Drakon Lord made a similar mistake, he landed behind the enemy lines completely forgetting about the magical power his adversary wielded and that he would immediately summon his minions to intercept hasty Elf. The arrogant Elves were quickly punished when reanimated by dark magic units attacked them with unnatural speed. The knights perished while the Drakon Lord held his ground, for now. The rest of the units maneuvered patiently. Elves commit more units to the fight. The mistakes of the previous actions prompted the Elves to commit units to the fight. Drakon Riders on both flanks charged the adversaries but while those on the left managed to get rid of the Wights, those on the right flank failed to rout their enemies. The shooters kept advancing through the center, secured the token and finally destroyed the Trolls. Some of the blunders that Elves committed brought dire consequences. The Drakon Lord paid the ultimate price for his folly and Undead units could advance towards Elven zone freely now. 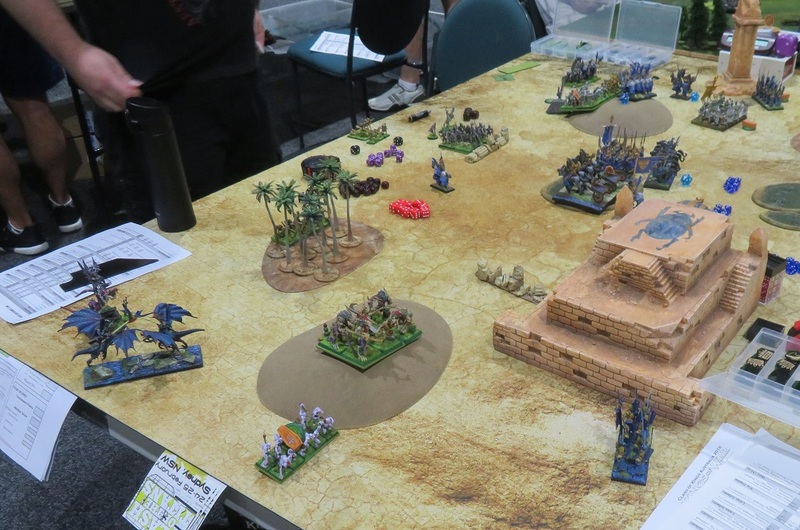 On the opposite flank the Mummies attacked the Elven Knights but somehow they failed to rout them. However, Soul Reavers would not miss the opportunity like that and destroyed the Drakon Riders. Elves change the direction of the attack. The battle enters decisive stage. The things didn't quite work well for the Elves but they were determined to turn the tide. First the Drakons on the left flank destroyed the enemy Archers in order to be able to threaten enemy from the vulnerable direction. Palace Guard moved forward to hopefully keep enemy in place, even if the odds were heavily against that. 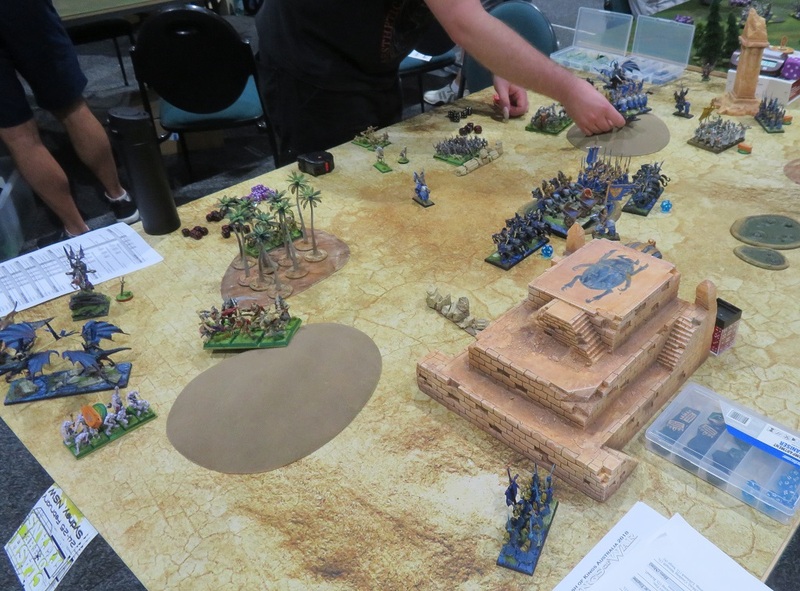 On the right flank, however, the situation changed in Elven favor. The Mummies had an exposed flank at the moment and two Guard units charged in to exploit that rare opportunity. They succeeded and claimed the token! Unfortunately, Storm Wind cavalry failed to rout the Archers again! Revenants fail to break the enemy too! Poor Palace Guard was not able to hold against combined attack of the Ghouls and Werewolves. Now the road for the Ghouls was wide open. 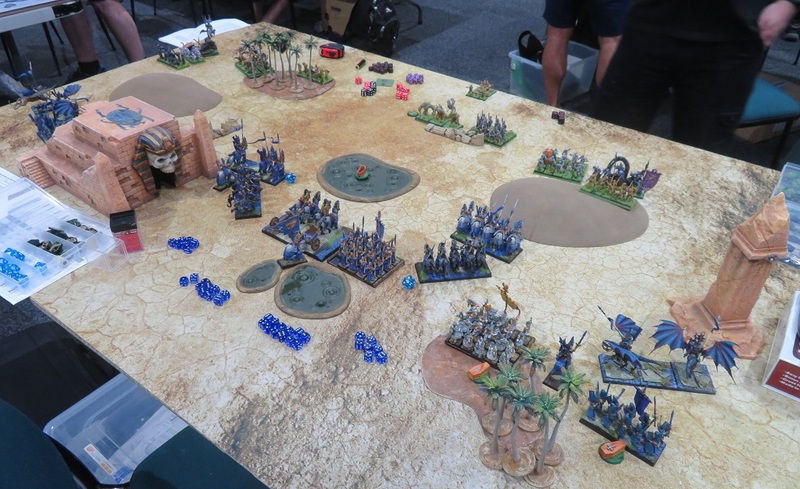 Revenants were now the ones whose speed of attack was boosted by dark magic but despite hitting the flank of Sea Guard they failed to rout the Elves! Ironically, the Archers defeated Elven Knights instead. And that put another Palace Guard in grave danger. This time the Revenants were attacked from two directions and destroyed while Guard units attacked enemy heroes. Only one of them was destroyed though. Soul Reavers attacked vulnerable Palace Guard and stole their token! 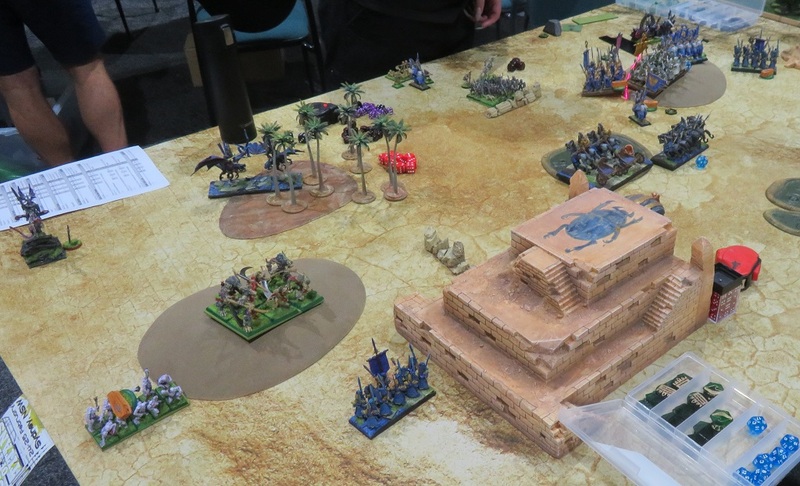 The Pharaoh moved to block the regiment from pursuing the Reavers. 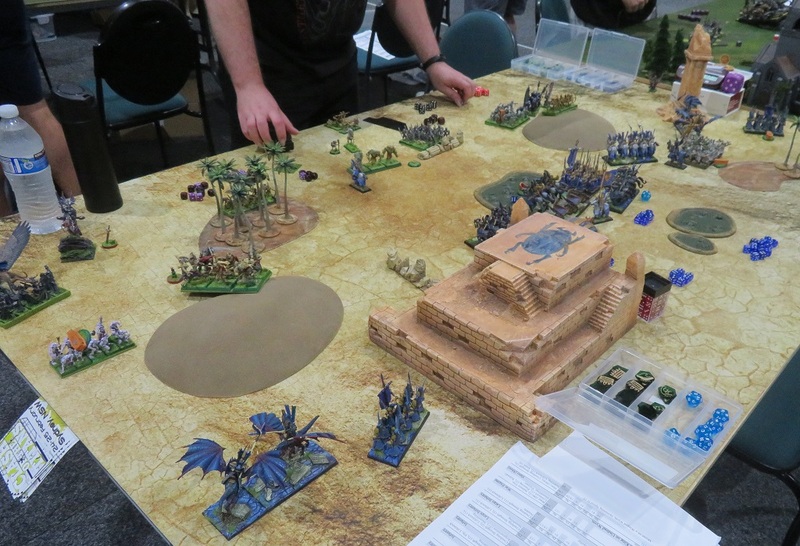 At the same time, the King and the Werewolved sped forward to catch up with the Elven army and try to reclaim the tokens. Due to pressure of time Elves could not execute all maneuvers and had to pick those that were the best. Unfortunately, they picked wrong. First, the Drakon Riders did not block the Werewolves. Second, the Sea Guard didn't moved away from the Werewolves. And third, Chariots moved in a way that pushed them back to their own zone. Undead had one shot to win the battle and they used it. Although the King failed to rout the Chariots, the Werewolves managed to destroy Sea Guard and claim their token that completely shifted the balance towards Undead. 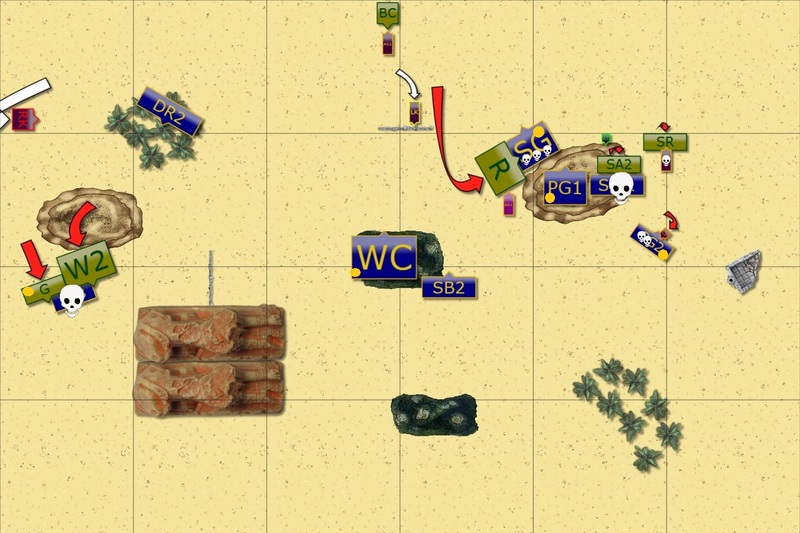 Elves, disheartened by the fact they lost the battle in the last possible moment, withdrew with remaining units. Well done, Chris! Your patience and persistence paid off and although I had 4 tokens in the zone at some stage I still lost it! I also wanted to apologize for being grumpy in the end but I was really mad at myself for making so many mistakes, including the ones in the last turn when I could have prevented the disaster to happen. When I look at this game one more time I really like how it developed, with some dramatic and unexpected moments like when heavy cavalry could not defeat the Archers and they finally got the best of the Elven knights! At the same time I need to admit I made a lot of mistakes again. It is thus quite lucky that I managed to have a real shot at claiming the victory in the end. Second, it was clearly a mistake to attack the banner with the Drakons. Not because it is unlikely that this unit can destroy it. I actually had a good chance to rout the Standard and advance into Soul Reavers to block them and to allow Storm Wind to help next turn. Unfortunately, I didn't rout neither Standard nor the Archers. 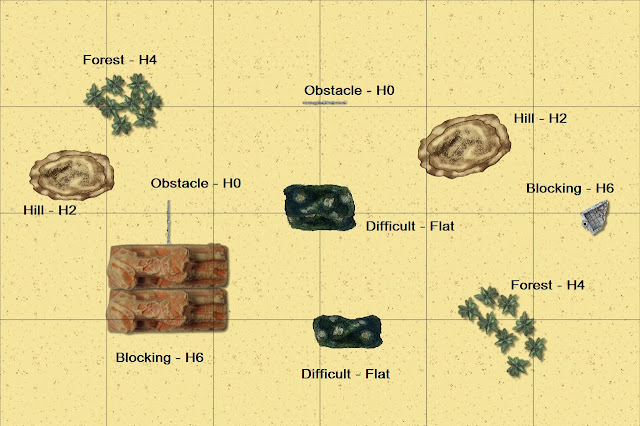 And mistake was to commit the Drakons to the fight that had dire consequences if I failed to destroy the enemy units. I am glad I used the opportunities to destroy the Mummies and the Revenants but I failed to capitalize on these successes. Even with the loss of Palace Guard troop (another consequence of a poorly timed attack by Drakons) I still had 3 tokens in the enemy zone and I needed to protect them. I should have moved away from the King and Werewolves so that all tokens are in the safer place. I should have made sure to reform Chariots in the way that would keep them in the enemy half. And mainly, I should have moved Drakons to attack Werewolves. Or at least land in front of them as I timed out in that turn anyway. Indeed, these mistakes were partially due to lack of time. But I had these precious seconds to move Drakons in front of Werewolves and that would have been enough to safe Sea Guard that had the token. I chose wrong and that cost me the battle. Firstly, I have to say, this was a great report to read! Push may be my favorite scenario. It makes for a really tactical game that gives you so many options, each time you play can feel completely different. 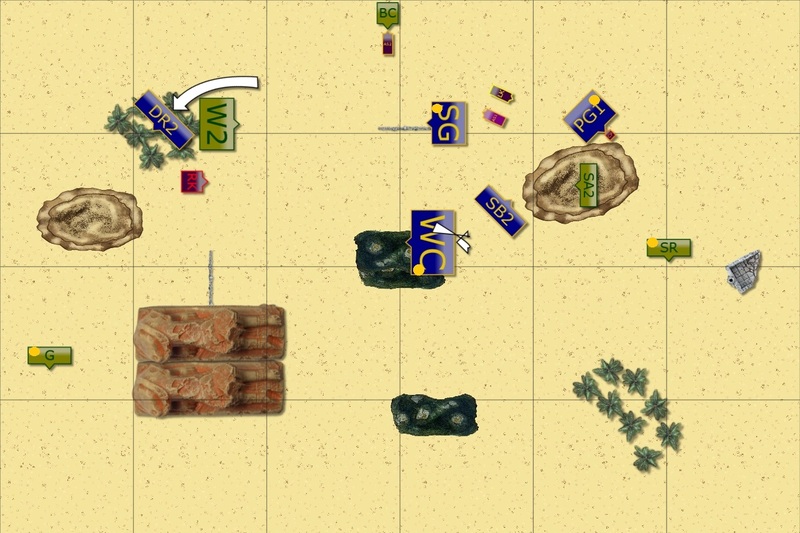 The number of tokens, where you place them, which unit gets them, and the terrain make for really unique battles even if you play a familiar opponent. There were definitely some mistakes to clean up, but you had all the pieces to win this game so definitely take heart in that. Blocking the werewolves or reforming the chariots would have been enough. Commuting the drakons too early into the standard was pretty costly as they are your big threats and need to be used to get a better return. But you made a lot of great moves as well! The flank combo charge on the mummies was beautiful! I’m sure you are going to “right the ship” and lead the elves to many victories quite soon! Looking forward to monster March! I have most of the model in hand which would be enough to get started with. Thanks a lot for your comment and kind words! I am glad to know you liked the game! Totally agree about the Drakons. The idea during the game was to intercept the Reavers behind but I didn't think it through properly. 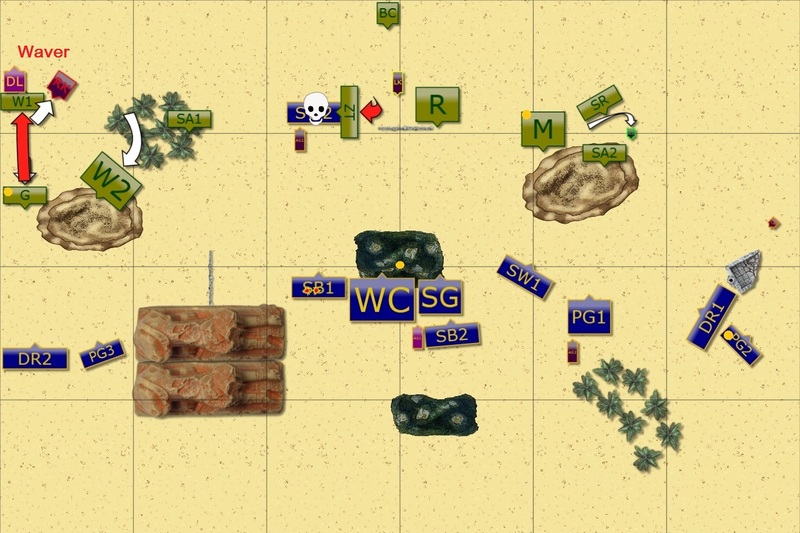 Even if I did get the Army Standard and then rolled enough to reach a new enemy, the odds to rout the Reavers as well were not that great. So it was really risky attack that quickly backfired. What is more, these Drakons, even sitting there, would be very useful to keep enemy units in check and prevent them from rushing towards my half as it happened in the end. Some flank charges were also due to poor rolling on Chris side but I guess being ready to use the opportunities is part of the game too. Thanks a lot for the support, I greatly appreciate that!